This year's Nobel Prize in Chemistry has a special meaning for us since our mentor, Sir James Fraser Stoddart is one of the laureates. He received the prize for his work on rotaxanes and catenanes towards the discovery of molecular machines. During his time as a WCU Professor at our department, Graduate School of EEWS, KAIST, he guided us on running research groups, mentoring students and helping to perfect our manuscripts. 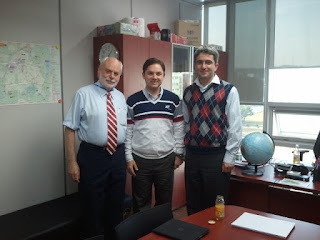 In Prof. Yavuz's office after a lively discussion. 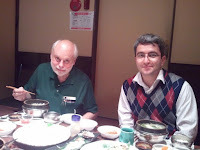 In particular, I vividly recall his help in Hasmukh's publication at Nature Communications. What makes his help even more special was his refusal to be even acknowledged for his time in editing and discussions. He is truly a remarkable mentor and an exceptional scientist, who needs no prize to be respected. And my special thanks to my friend, collaborator and colleague, Prof. Ali Coskun for strengthening our relationship with Fraser. I'm also thankful for Prof. Jang Wook Choi, for his efforts to bring him to our department.